Luke Palmer, CJ Bio America senior operations manager, looks on at the plant recently. Palmer is standing on the first floor of the plant where raw material is stored. The lysine, already being produced, is biologically grown through mass fermentation. The first is a soil amendment used on cornfields within a 60-mile radius, Palmer said. “It replaces anhydrous ammonia,” he said. CJ Bio America’s parent company is CJ CheilJedang, a South Korean food company based in Seoul. It manufactures food ingredients, food, pharmaceuticals and biotechnology. Palmer, who was hired by the company in 2012, said he’s enjoyed witnessing the growth of the business. Palmer said the company hasn’t experienced some of the workforce challenges other business have locally. In terms of the United States’ trade negotiations with countries like China, Palmer sees that as a positive step for the industry overall. 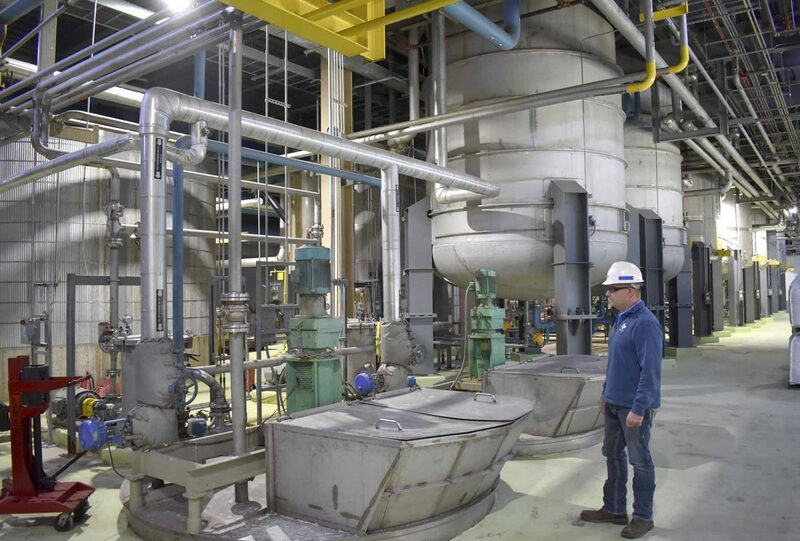 As CJ Bio America continues to expand its production of amino acids, the company added another amenity to benefit its approximately 200 employees in the fall of 2018. A 10,000-square-foot fitness center was built on the northwest corner of the property. It is a separate building from the plant. The new facility includes a gymnasium to be used for basketball, volleyball, and tennis. It features a weight lifting room with ellipticals, treadmills, and free weights. Rooms for a golf simulator and ping pong tables are also available. The equipment is free to use for employees and their registered dependents, Palmer said. Construction on the fitness center began in the summer of 2018. It was completed in November. In the mid-1990s, CJ CheilJedang separated from Samsung to become its own entity. “The company still has very close ties to Samsung,” Palmer said.